Finding a home for all my tools after finishing the bathroom. Required a little construction and some clever storage ideas. We actually got it all in there though. Accessible still too, which was the whole idea. It really feels good to have that all organized and settled in. Now to finish up the sauna and trim. Then we are all caught up for a little bit. Next may be the countertops or the bathroom upstairs. No rush though. That is the nice thing about living in the project. No hurries, no worries. ^The closet/workshop at about the half way point. I am not a good carpenter by any means, but I try hard and this was a first for hanging a door. Let's just say I learned a lot for the next time I hang a door. Thankfully this is just an outdoor closet so there is a little margin for acceptable error. It is gonna save our lives though with all my tools in one accessible place. ^Starting to get settled in at this point. A little peek at the key to the whole system. Getting everything out of buckets and tools bags and onto the wall. 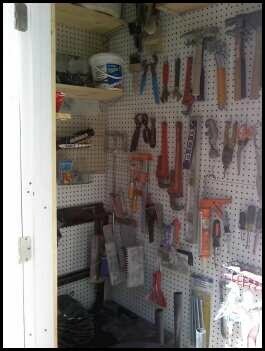 Layered storage on peg board going the distance. 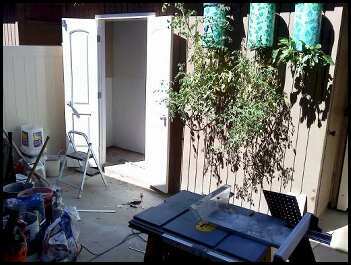 The workshop area will spill out onto the back patio. All the saws and power tools can easily be pulled out and set up on saw horses on the patio. Unroll, work, roll up and lock up every day. Perfect. ^Larry is his name. Larry works for ARUP on the hill near the University of Utah. Larry is always trying to get coworkers and friends to hike the "Living Room" trail with him on lunch break. Christine audits ARUP and Larry issued the challenge to her and a coworker, Matt Klein. Christine invited me to join them one evening after their work was done. Matt, Larry, and another coworker, Ethan, met Christine, Murphy and I in the parking lot at ARUP. Immediately Larry starting giving us the back story on this whole tradition. The word on the street is that Larry makes a mean carrot cake. The word on the street is also that Larry is in mean shape. Larry has seen his sixtieth birthday, but he can run this route in something like 33 minutes, and then still have time to eat his lunch on his lunch hour. Larry has issued a challenge to fellow employees and friends to beat his best time and he will bake you a carrot cake. On this particular 100 degree Utah evening we were not going for any records. We casually made our way up to the overlook chatting and taking breaks all the way up. However, Larry called out that he thought that you really had to jog down. 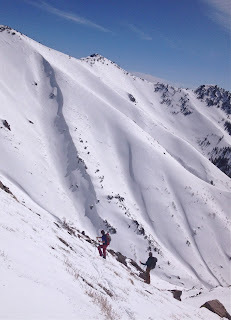 We all jumped on board and got out of our rock built chairs and started downhill. Larry took off quick and I decided I wanted to get a photo of him for the site. I got out my camera phone and took off after him. He felt me coming up hot and though he'd have some fun with this youngster and picked up the pace. Next thing I knew Larry and I were in a full out sprint down the path weaving through sharp turns and leaps. I found myself hooting and hollering through a few sketchy spots and I could hear Larry laughing at my thrills from just up ahead. 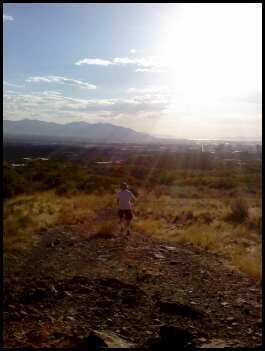 I managed to snap off this one good photo of Larry running into the Salt Lake City sunset. I had a blast chasing Larry down the trail and I will have to admit that I was a bit soar for the next few days. I think that Larry's best time is quite a lofty goal that maybe I should work into my comeback training this fall. From what I hear the carrot cake might be worth the effort.